ACP methods can be easily explained and demonstrated in any number of presentation formats and many of the fundamental principles and concepts can be adapted into other methods. All presentations include PowerPoint presentations, 'before & after' video footage and where possible (in most cases), live demonstrations with real dogs. The defining factor governing how these presentations are delivered will be the amount of time allocated and venue provided for this service. If logistics demand less hands-on with real dogs, Greg can provide relevant video footage from his archives or he can arrive a day or two earlier and work with locally provided 'problem' dogs and film the 'before & after' behaviours prior to a presentation for larger groups. 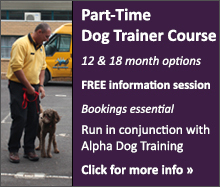 Alpha Canine Professional can also conduct seminars at its own training and kennel facility. 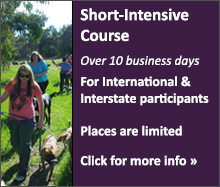 This is a great option for trainer/instructor groups looking to apply the skills being taught on their own dogs and the many different dogs available for 'hands-on' training. Greg Fontana is the training director for Alpha Canine Professional and has been active in the dog training industry for over 25 years. Since 1996 however (when he started his own businesses), he has been at the forefront of many obedience training and canine behavioural problem solving innovations in our industry that are now revolutionising the way dog owners and trainers are taught to understand and train dogs. Greg has a reputation for 'hands-on' teaching and demonstration and is at his best when inspiring others to get excited about the positive results that can be achieved by practical and effective methods that really work! His knowledge is current, relevant and backed up by results that just can't be argued, especially when you see them in action. The Leadership Obedience and Canine Good Behaviour Shaping methods that Greg and his team have tirelessly researched and developed since 1996 take consistency to entirely new and exciting levels of understanding that redefine this vital concept and its relevance to canine communication. Greg's pioneering work on The Pattern Learning Training Method, Canine Good Behaviour Shaping, Reset Learning, Reinforcement Contrast Effect, Reinforcement Crossover Consistency and Alpha Canine Behavioural Rehabilitation are raising the expectations of what can be achieved, even in a single session, with difficult dogs during group classes or private consults. There are many, many opinions and theories bandied around the dog training world relating to common canine behavioural problems. Behavioural issues such as aggression (all types), fear, anxiety and over-excitability are often over-theorised and then addressed with over-complicated approaches that rely too heavily on outdated, food bribing techniques. Greg believes it is time to move beyond the popular and clichéd theories that promote unrealistic ideals and attitudes that can't be demonstrated or don't relate to so-called difficult dogs. Over the years Greg has developed a teaching and lecturing style that is both entertaining and informative. 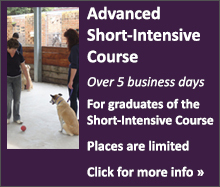 His extensive experience and expertise in helping owners with extreme and difficult dogs in group classes, private tuition or boarding school scenarios has given him the opportunity to put his methods to the test in a broad set of applications. To that end Greg can show trainers and dog owners how to apply his methods in real-time and in varying situations. The topics below are but a selection of concepts offered for lectures and workshops. Greg is more than happy to tailor his seminars or lectures to specific requirements for public or professional audiences. It's always best to call Greg and discuss your specific needs and goals, he is more than happy to explain this service in great detail. Going beyond the popular food reward and competition approaches to training obedience and demonstrating how to teach consistent 'language' that dogs clearly understand when not in training mode. Leadership obedience training sets a very clear 'precedence' for all other interactions between the owner and their dog. Learn how to create leadership in the owner and dog relationship based on trust and understanding. This approach teaches owners to read their dogs and dogs to trust and follow their owners. These two fundamental concepts are relevant to every dog we train in obedience. Understanding how obedience can help owners to have a real impact on their dog's behavioural choices gives the teaching of sit and stay an entirely new relevance to the real-world. The positive power of "NO"! This is canine learning theory applied in reality and under distraction to achieve amazing and positive outcomes. Where many trainers and behaviourists are stuck in a groove relating to exaggerated applications of "NO" and physical correction as harsh and unnecessary whilst at the same time promoting 'positive and gentle' methods that just don't work, Greg will explain and demonstrate modern concepts that go beyond the popular and simplistic dichotomies relating to this often emotive subject. Those who focus on, and only present the negative side of learning theory without including the acceptable contrasting to positives as part of the same learning equation are showing blatant lack of understanding of how dogs learn in realistic situations. Not all negatives are the same! Read, Recognise, Relate & Respond - Four simple guidelines that are relevant to handling and training dogs. This principle is used daily by our professional trainers and instructors within our busy, dog related businesses here in Melbourne, Australia. This important process goes beyond the often simplistic concepts relating to reading canine body language and behavioural responses. Not all canine behaviour is as it seems, especially when it comes to aggressive, anxious and fearful responses. Understanding how to work through a dog's initial response to a given situation is an important part demonstrating your overall understanding canine behaviour. A tried and tested system of canine communication that sets the precedent of clear and consistent leadership. The development of CGBS has an interesting background based on working with real owners and their dogs in their home environments, but not just from perspective of private tuition. There are four common leadership challenges that occur in virtually every home and within every owner and dog relationship on a daily basis. Understanding how to shape demanding and pushy canine behaviour is a fundamental aspect of any successful canine behavioural rehabilitation. However, many of these pushy and demanding canine behaviours are often overlooked, or even worse, ignored or tolerated by many trainers and behaviourists and as a result they often tend to focus on the symptom rather than the underlying problems. This can be easily proven in real-time with real owners and their dogs and the positive results are clear for all to see. Aggression has many levels of intensity, many different forms and infinite possible causes. However, the dog's aggressive behaviour is not the primary focus of the rehabilitation process. We can show an alternative understanding of canine aggression based on methods that have been developed and then applied in countless real-life situations – Real owners, Real dogs... Real RESULTS! All lectures (when possible), workshops and seminars include live demonstrations and plenty of video 'before and after' footage. Complex and lengthy canine behavioural questionnaires are ineffective on many different levels and rely too heavily on the owner's interpretation of their dog's behavioural issues. Many of these questionnaires are superficial at best and miss so much critical information that can only be gained by watching the owner and dog in action. There are specific and relevant scenarios that can be set up and assessed to give the trainer a clear understanding of owner and dog relationship. When carried out by skilled trainers there is plenty of time to discuss relevant issues and to structure relevant questioning around what is actually happening in real-time. The 'interactive' assessment saves time, avoids potential confusion and produces results that validate the trainer's understanding and approach to the dog's behavioural and training problems. These results gained through interactive assessment motivate and inspire owners to follow the important guidelines and strategies required to achieve positive outcomes. In literally thousands of cases brought to us by concerned owners over the years we have found that breed type and genetic predisposition have been given (by dog trainers and behaviourists) as reasons for a dog's behavioural issues and why they supposedly can't be modified, managed or rehabilitated. We have successfully overridden many of these judgments by assessing and addressing all tangible factors affecting the owner and dog relationship and then applying obedience training and behavioural modification methods that have proven to have an impact on the overall situation – not just the perceived 'major' problem. This has all been achieved without food bribes or invasive, mind-altering drug therapy. There are many obvious communication and leadership factors to be taken into account before any genetic or faulty wiring in the dog's brain can be singled out as the cause of a dog's behavioural issues. In far too many cases that we have successfully dealt with these leadership factors have been previously ignored or misunderstood by dog trainers and behaviourists. There are many other lecture topics available and most lectures can be combined with workshops in a seminar format that can be run over one or more days. Greg is happy to discuss his methods and how they could be adapted into specific training applications. Greg has presented many lectures and workshops for various vets (for vet staff and/or clients), breed clubs, dog training clubs (for trainers and members), various canine organisations and for the general public. His presentation style revolves around 'showing' real examples of the concepts and principles he uses to educate dog owners on a daily basis. The information is easy to understand and the terminology is based on relevant concepts used within the methods he applies to help owners solve their dog's behavioural issues. Greg and a team of trainers from Alpha Dog Training spoke at an introductory lecture for dog owners held at the Yarraville Village Animal Hospital on the 22nd of July 2004. Demand for the session was unprecedented with over fifty members of the public attending. Greg is an assured and intelligent speaker. He expertly explained the importance of good communication between owners and their dogs in eliminating problem behaviours and was able to comprehensively address the specific concerns of those attending. These ranged from 'getting my dog to sit' through to curbing unnecessary behaviours such as excessive barking. In the days following the lecture many dog owners contacted the clinic to thank us for holding the event. They remarked that their dogs had already responded to the principles they had learnt from the evening and were much better behaved. Canine behaviour problems are something we encounter on a daily basis at our clinic and I would thoroughly recommend the highly professional training programs that Greg and the team From Alpha Dog Training are able to offer."